A couple thousand pieces and a couple million words. In my mind … I have something to say and I say it. Maybe it all means nothing and as Frost suggests … I am one of those who have nothing to say but say it. If I say it … I own my words. I say this because we are edging into a world where people are of an age that are shifting into leadership positions, positions of influence, who … well … have blogs or have written for blogs. And, uh oh, they are being demanded to justify their words, thoughts and ideas. In other words … they are being asked to own their words. They may have had nothing to say but they said something and now they have to explain something about their nothing. This is all incredibly interesting <and slightly amusing> to me because if you go online you will find thousands of writing advice columns <usually formatted in the heinous listicles and written by self righteous older people> written for the attention of young people … warning them of the dangers of what they put online and how it can affect their future employment. The amusing part? I found none <zero> advice columns directed toward … well … me <self righteous older people>. And you know why? Because we older folk are supposed to know better. Some of us do not know better. There are lawyers seeking higher positions, business people seeking a seat in a C-level suite and even doctors seeking to shift into a more general business world who are finding that their words are following them <and they need to own them>. And, no, “it was just my personal opinion on my personal blog” doesn’t hack it. if you shared a thought you own the words in how you shared it, therefore, you own the thought AND the words. To be fair … I will spend a second in the tricky part. Is the past a predictor? Should we waste our time revisiting the blog writings of someone who most likely sat down and vented personal thoughts on things of matter? And … maybe more importantly … should we be held accountable for words we decided to put down and share on the world wide web? Simplistically I would say … of course we should be held accountable for the words then … just as, of course, what we said then may be different than what we would say now … and we need to own those words <and justify the difference>. 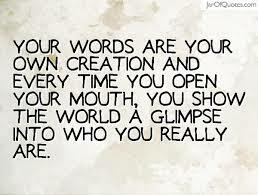 If you write, you own the words. Therefore, use words with care. I don’t have time for many blogs … the daily diaries, the motivational tripe, the pieces that don’t really have a point, emotional directionless solution-lacking pieces … these have some value in some ways but they aren’t really the potent things <albeit … you own those words too so be careful>. But many blogs are there to make a point. And if you make a point, you own it. And … you own the words you use to make that point. I make no mistake when I post something in that I know when I open my mind and share my words they represent a potent formula that can be drunk with pleasure or peril. I know whether it is a large presentation, a one-on-one discussion or a 998 word post on my blog I am doing so as a public speaker. I own my words. I own my thoughts. I am surprised when older people get trapped in business discussions having to discuss things they may have written. I am surprised because I know when I write and share those words … I can use these words as a constructive force or a destructive force. And with either path I own what I construct as well as own what I deconstruct. What also surprises me a little is that older people who have blogs or write opinion pieces are not young inexperienced people but, if you are making a point, you really do know that simply ranting or using some childish phrasing or hyperbolic rhetoric diminishes what you have to say. And I say that knowing I am free with the swear words and generous with snarkiness. But what helps me is that I have found over time that conceptually I write in the same framework as I learned how to communicate in the professional world. 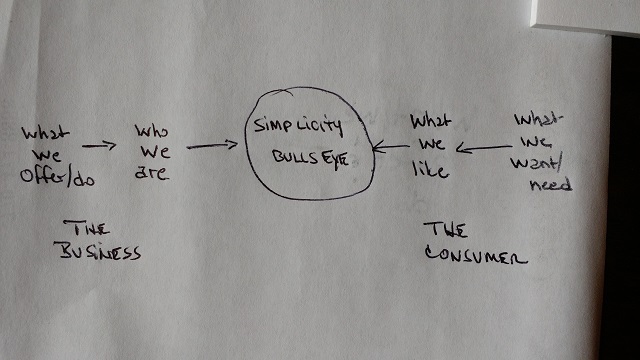 Stylistically it is me … all me <maddening to some people who visit the site> … but the framework resides in what I have always believed is the most simplistic way to create a simple message. Sure. I may not communicate what I want to say simply but underneath the swear words, the snarkiness, the faux intellectualism and the casual use of grammar resides a desire to hit what I have always believed is the message simplicity bullseye <by the way … anyone, blogger, opinion writer and even a communications agency can use this simplistic guide>. 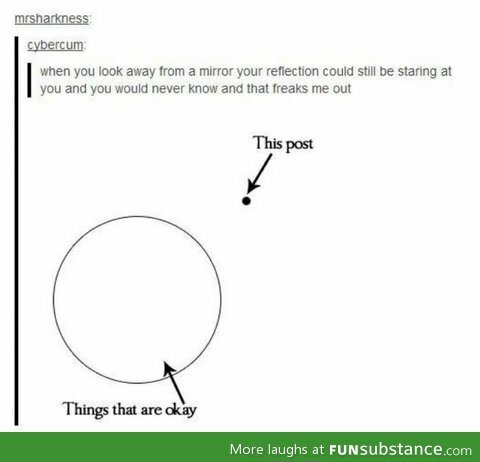 On one axis, the horizontal, you are bookended in framing. On one end is whatever issue & solution I can offer — functionally what I have to offer <my experience, my ideas, my thinking> — followed in toward the bullseye by … well … me, the writer, and who I am and what I stand for <so that my thinking gets filtered through who and what I am … lets call that my character>. On the other end is the need or want – functionally what is needed – followed in toward the bullseye by what the situation, or people, may desire <or think they desire> so that pragmatism gets filtered through the sometimes random irrational minds of people. 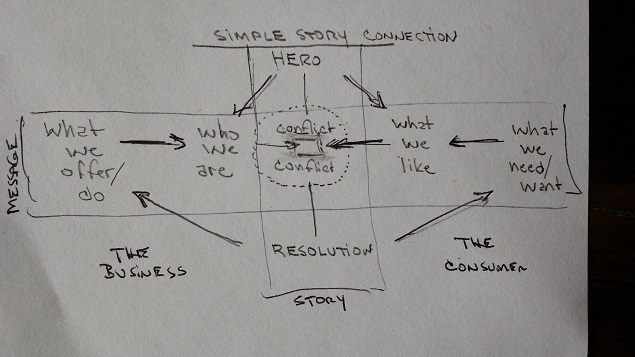 The other axis, the vertical, is even simpler … hero, conflict and resolution. It is basic story telling applied to ideas. All this permits me even in my most dry pieces to attempt to offer my version of a story which, as stories are supposed to do, address deeper and enduring emotional levels tapping into personal “issues” such as self-esteem <conformity versus individuality>, self-doubt and economic wellbeing. Everyone who writes should have a story. They shouldn’t toss out words thoughtlessly, or worse, irreverently. Anger doesn’t guide a good story <typically> but as long as you continue to aim forward the bullseye even an anger driven critique can end up in an okay place when viewed by someone in the future. And all of that matters if you assume at some point someone will demand you own your words. Imbue with your personality & character <which will inevitably be captured in the hero apects>. I could argue, and I would, that if you stay within this framework what you write today will be representative of something you want to say tomorrow. You may not want to say exactly the same thing today, or tomorrow, as you did in the past but you will most likely be able to leverage from the past to what you want to say. I mention this today not just to share my framework for writing but rather because many people my age, or slightly younger, are being measured more and more by the words they shared online. And more and more of them are finding that they have to choose between what they believe in <most likely reflected in something they wrote in the past> and what they need to say to get what they want in the moment. That seems kind of nuts to me … that choice I mean. What I want today should be aligned with what I believe in. I can take a fairly hard stance on a variety of issues, and I have, but I also hope that my heroes & resolutions reflect adaptability to other’s views and the situation at hand. When I do meet new business people or people I haven’t seen in a while and sometimes they bring up something I have written … well … let’s say 5 years ago … I am good. I may not think exactly what I did then but my basic beliefs have not changed. It surprises me when some fairly qualified people have not assumed that stance in what they have written. I will not suggest we should all get our words right every time <I surely don’t> but not all words are created equal and the really important ones … the potent ones … the ones that can construct or deconstruct … you should get right. At least right enough that someday in the future your career will not hang in the balance over a poorly thought out blog piece. Conversely, if you did think it out and your career can hang in the balance over it … well … you made a stand. And backing off that stand simply to get to where you want to be is … well … not good. My writing style, or lack of style, aside … I don’t understand ever being trapped by owning your own words if you have decided to be “true to thineself” no matter what. I said something then and maybe I could have used better words but the basic thought premise is what I believe. Take it or leave it because getting the job, sitting at some table in a discussion, getting something I want doesn’t mean that thought can be discarded … if I believe it … well … I own it. I will admit that owning up can be difficult but, as I once said, mistakes or things you have said in the past can be an awful lot like a hurricane … and “I” is always at the center of a hurricane — stay steady and hold the center. I have no time and I have no patience for older people who do not own their words. And they should be ashamed of themselves for discarding thoughts and words so easily just to get something they want now. 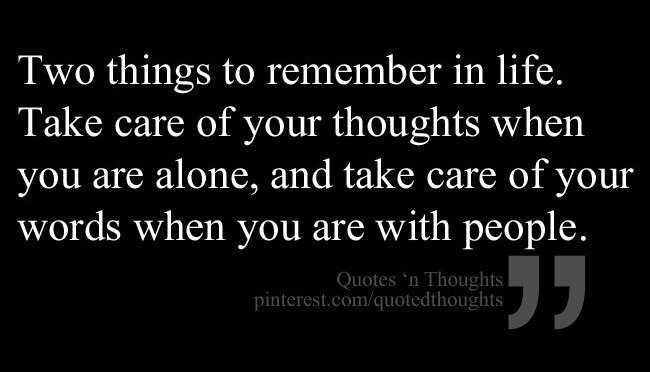 Thoughts and words are far too valuable to be that disposable.